With a surface area of 505,990 km2, located in the southwest of Europe, and bordering France and Portugal, Spain is home to nearly 47 million (2012) people and is the second largest country of the EU. Besides the mainland, the Spanish territory encompasses the Iberian Peninsula, the Balearic Islands, the Canary Islands, Ceuta and Melilla in North Africa as well as several peñónes (offshore island forts) at the Moroccan coast. Spain is a parliamentary constitutional monarchy, divided into 17 autonomous regions that are culturally as diverse and fascinating as the country’s landscapes ranging from snow-capped mountains to green valleys, deep forests, barren plains and golden beaches. These in particular, attract millions of visitors every year, but Spain offers much more than just beautiful shores. The North of Spain is characterised by a continental climate with hot summers and cold winters, although the regions bordering or in close proximity to the Atlantic Ocean (Galicia, Asturias, Cantabria, Basque Country and Navarra) experience a more maritime climate with cool summers and mild winters – and with plenty of rain, which is why this part of Spain is also called "Green Spain". Lush pastures, dense forests, rolling hills and wide valleys with picturesque villages at the foot of high mountain ranges make Northern Spain a true nature paradise and the perfect holiday destination for all outdoor lovers. A great way of exploring España Verde is by hiking or cycling along the Camino de Santiago – this famous pilgrimage route takes you through the most amazing landscapes of Northern Spain and you will stop over in historic cities like León and Burgos before reaching Santiago de Compostela in the northwestern Galicia, where you will relax on some of the country’s finest beaches. The capital city Madrid is not only the political, economic and cultural centre of Spain but also the geographical one. Colourful, vivid and passionate – this metropolis sweeps away its visitors with its typical Spanish temperament. Fine arts, fine dining, superb shopping possibilities and a vibrant nightlife – all you could wish for a varied city holiday, you will definitely find it here. Together with its surrounding regions Castilla y León and Castilla-La Mancha and even Extremadura, Madrid lies in the Meseta Central, a highland plateau with several mountain ranges. 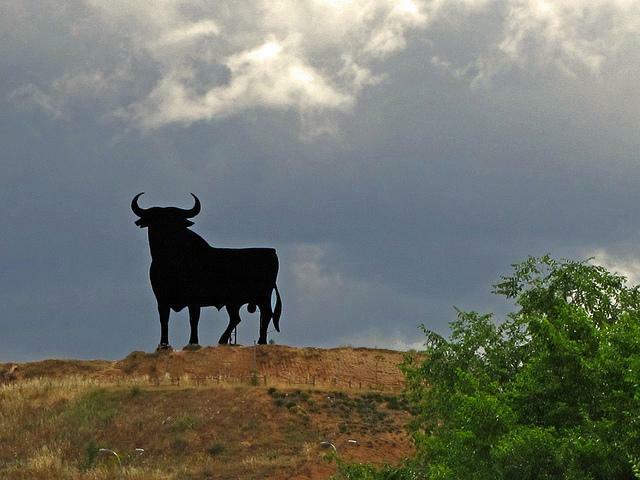 The plateau covers a vast proportion of the country and although these plains are quite arid, some of the best Spanish wines are produced here. Mainland Spain’s Mediterranean coastline extends over more than 1,600 kilometres, from Catalonia in the northeast down to Andalusia in the very south. With such illustrious names as Costa del Sol, Costa Blanca and Costa de la Luz, the Spanish seaside resorts like Marbella attract every year masses of sun seeking holidaymakers, who, very often, pay only little attention to this region’s beautiful cities and their outstanding cultural heritage. For more than 700 years, almost the entire country was under Muslim rule and this influence is especially evident in the architecture of the south, which was the heartland of al-Andalus. The Alhambra of Granada, the Giralda of Seville and the Mosque-Cathedral of Cordoba are masterpieces of Moorish architecture. In Barcelona, however, you won’t find anything similar, because Spain’s second largest city formed part of Muslim Spain only for a short time. It is nonetheless a very artistic city with a truly cosmopolitan flair and one of pearls on the Spanish Mediterranean coast. The Balearic and the Canary Islands are also very sought after holiday destinations in Spain. While the Balearic Islands are located in the Mediterranean, the Canaries lie southwest off the Moroccan coast. They consists of seven larger islands - Gran Canaria, Fuerteventura, Lanzarote, Tenerife, La Palma, La Gomera, El Hierro - and several other smaller ones. Volcanism and a subtropical climate have created landscapes and a flora and fauna that are unique in the world. In contrast, the climate of Mallorca, Menorca, Ibiza, Formentera and Cabrera is typically Mediterranean and their coasts are rather rocky with many picturesque inlets and hidden coves, whereas the Canaries’ beaches are long and sandy. Thanks to their favourable climates, rich nature and multi-faceted cultures, both archipelagos make wonderful year-round holiday destinations, just like the rest of Spain - an exciting country full of contrasts and rich in culture and traditions, shaped by millennia of history. Mediterranean or Atlantic Ocean? Balearic Islands or Canaries? Or rather the Spanish mainland? Deciding where to spend your next Spain summer holidays is not easy because with an unbelievable 4,964 kilometres of coastline, this country spoils you for choice! Whether you prefer Mallorca’s idyllic coves, Lanzarote’s extraordinary black sandy beaches or the golden sands on the Atlantic, Spain is a true beach paradise catering for all tastes and requirements. From the spectacular rías of Galicia down to the sun-drenched Costa del Sol in Andalusia, countless beaches and seaside resorts in Spain are regularly awarded the Blue Flag and offer best conditions for swimming, sun bathing and water sports. The Atlantic coastline of mainland Spain stretches from the Portuguese border all along the Bay of Biscay up to the French border and it also includes the western part of Andalusia, which lies in the south of the country. Spain’s northern Atlantic coast is enchantingly beautiful and full of contrasts –sandy beaches alternate with steep rugged cliffs. It is extraordinarily spectacular in Galicia where rivers have dug deep into the rock and formed fjord-like estuaries, the so-called rías. The water in these sheltered inlets and bays is quite calm and not too cold, although the open Atlantic Ocean can be very rough. Galicia is, by the way, not only the region in Spain with most beaches but also the one with the most Blue Flag beaches and finding a secluded spot won’t be difficult. Just like the south, northern Spain also has some beautiful Costas – Costa de Cantabria, Costa Verde or Costa Vasca, for instance – where the water is of such an intense turquoise blue, that you will even forget that you are not in the Mediterranean! The Canary Islands must be included here as they also lie in the Atlantic Ocean, off the southwest coast of Morocco. With their mild and constantly warm subtropical climate, these seven islands are an optimal all-year-round beach holiday destination. Although the region boasts unique natural habitats and stunning volcanic landscapes, most visitors are mainly attracted to the beaches. With more than 1,500 kilometres of coastline, there should be the right beach for everyone! Gran Canaria’s shallow golden sandy beaches, like Playa del Inglés or Playa de las Canteras, are perfect for families as they are easily accessible and well serviced (e.g. toilets, showers, lifeguards, restaurants etc.). La Palma and Tenerife feature stunning black beaches, whereas Fuerteventura and Lanzarote are great for wind and kite surfing as well as sailing and scuba diving. Mainland Spain’s Mediterranean coastline runs from northern Catalonia southwards to the Straits of Gibraltar and just like the north, it is divided into different coastal stretches, the so-called costas. Their beaches are lovely - wide, long and sandy – and well equipped with facilities, but unfortunately they are also very crowded during the summer months and the bustling sea side resorts might not be everyone’s cup of tea. However, if you are planning a beach holiday for instance in Marbella on the Costa del Sol, it might be a good idea to come during off-season, when there are less people and the sea is still pleasantly warm. 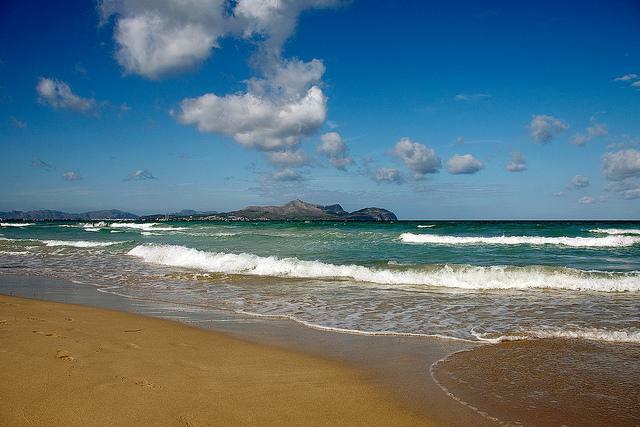 While the Costa Brava (north of Barcelona) is rather rocky with many little inlets, both the Costa Dorada (south of Barcelona) and Costa Blanca (Alicante) owe their names to their beautiful sandy beaches. The Balearic Islands are also among the most popular tourist destinations in Spain. This archipelago consists of four islands off the country’s eastern coast and features some of the nicest beaches in the entire Mediterranean. They are mainly sandy or pebbly and located in countless picturesque calas (coves) with crystal clear waters that are perfect for snorkelling and diving. Of course you will also find long sandy beaches where you can engage in all kinds of water sports. While Mallorca and Ibiza are both very lively and offer plenty of activities and entertainment during day and night, Menorca and Formentera are quieter and the perfect choice for anyone wishing to spend relaxed seaside holidays in Spain and gain new strength in unspoilt nature. Paella, tortillas, gazpacho, chorizo, churros...Spanish food is simple yet delicious, prepared from fresh local or regional ingredients. The traditional dishes and recipes have been created over the centuries by the ordinary people — farmers, shepherds and workers, and until the present day they have hardly changed. Spanish food is nonetheless incredibly diverse. Not only does each region have its very own recipes based on local produce, but all occupiers - Phoenicians, Romans, Greeks, Arabs – brought along their own flavours. And with Columbus’ discovery of the New World, even new crops, which the Spanish cuisine could do no longer without, reached Spain: potatoes and tomatoes. The most important meal in Spain is lunch. The comida is usually taken at around 2 pm and consists of several courses. Soup or salad is served as a starter, followed by the main course, which can be meat or fish. Last but not least the dessert, rounded off with some coffee or a shot of liquor. ¡Buen provecho! Soup is served hot in almost every country in the world, however, in some regions in Spain, such as Andalusia, this is not always the case. Gazpacho, a nutritious tomato soup with raw vegetables, was invented here and serving it cold was a brilliant idea because in southern Spain’s scorching summer heat, the last thing you would feel like is a hot soup. In contrast, Caldo Gallego, a popular broth from Galicia, is eaten hot. Besides hot and cold vegetable soups, you will often find stews on the menu of many restaurants in Spain. Stews are the Spaniards’ favourite way of preparing meat (mainly pork), although there is also a large variety of other meat dishes including sausages and roasts (lamb, veal, beef). Cocido madrileño is a stew cooked in Madrid from pork and chickpeas and most probably it derived from the Jewish adafina. Fabada asturiana, originating from Asturias, is a very similar dish, however, it is made with white beans, sausages and pork – don’t miss it, it’s an absolute classic of the Spanish cuisine! Bordered by two different seas, seafood has always played an important role in Spain. When visiting coastal regions like Catalonia, Valencia, Basque Country or the Balearic Islands, you will be amazed by the tremendous wealth of fresh fish these regions offer. Cod features in many fish dishes of the north, for instance, in Bacalao al Pil Pil, a wonderful recipe from the Basque country, whereby this Atlantic fish is cooked in a simple yet very tasty olive oil, garlic and chili sauce. When you spend your Spain holidays in the Balearic Islands, you will certainly come across this Ibiza speciality called Burrida de Ratjada, which is skate with roasted and crushed almonds served with Alioli (garlic mayonnaise). It's an ongoing debate, whether rice was introduced by the Romans or the Moors, but it remains a fact that it is a very important ingredient in Spanish cooking. 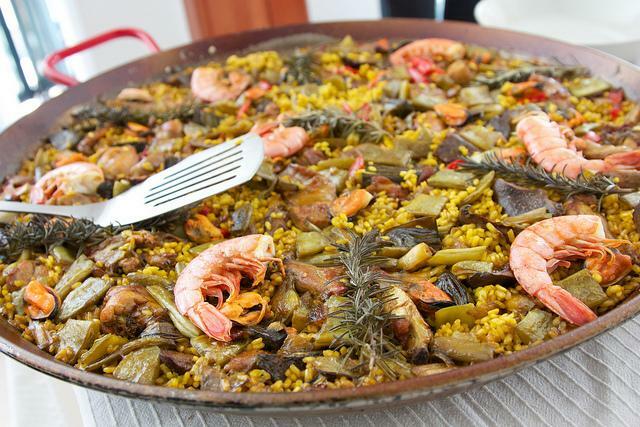 One such dish and maybe the most famous Spanish dish ever is Paella. Today, there are many different varieties of this rice dish, some only contain meat, some just seafood and some have both. Whichever variant you prefer, saffron is the essential spice in all of them! Tapas (also known as pinchos) is another Spanish food that is known around the world. These small appetizers are usually served in bars as cold snacks and can be anything from a salad to a sandwich. In some regions, tapas can also include croquetas (croquettes filled with ham, cod, chicken or spinach), patatas bravas (potato wedges in a spicy tomato sauce), empanadas (meat, fish or vegetables pies) or the Spanish tortilla. The Spanish have a sweet tooth and therefore you can also look forward to some really mouth-watering sweets when on holiday in Spain! Almonds and honey are used in many of them and in sweets like Turrón, a nougat speciality that can be either hard (Alicante) or soft (Jijona), you can literally taste the oriental influence. Chocolate con churros is another irresistible Spanish sweet. These fried dough sticks are usually eaten for breakfast or as a snack rather than as a dessert. Could there be a better way of starting a new exciting vacation day than dipping this warm crispy fritter into thick creamy hot chocolate? Spain is a classic summer holiday destination and while the majority of visitors is happy to just relax and sunbathe on this country's magnificent beaches, the real adventurers among you will expect more from their holidays than sun and beach – and they certainly won't be disappointed! Spain offers a whole lot of different activities including hiking, climbing, paragliding, cycling, mountain biking, golfing, horseback riding and even skiing. Thanks to its rich and diverse nature and breath-taking sceneries, this country is a true year-round outdoor paradise and an excellent choice for anyone wishing to spend exciting, unforgettable and action-packed days abroad. If water is your element but you are looking for something more challenging than just swimming or bathing, why don't you try surfing or diving? With reliable winds and wide shallow sandy beaches, there couldn't be any better place for any kind of surfing in Spain than the Canary Islands. Gran Canaria, Fuerteventura, Lanzarote and Tenerife produce such fantastic waves throughout the year that they are often referred to as the "Hawaii of Europe". However, even mainland Spain offers numerous world class surf spots, many of which are located on the Atlantic coast in the north of the country. Mundaka, for instance, a small fishing village in the Basque Country, turns into Europe's surfing hot spot every year. From autumn well into spring, surfers from all around the globe flock here, hoping for the ride of their lives on one of the best rivermouth waves in the world. Tarifa in Andalusia is not just another great surfing location - especially for wind and kitesurfing - but it is also a good location for scuba diving. Here, where the cool Atlantic meets the warm Mediterranean, unique ecosystems brimming with marine life have formed. The richness of the Mediterranean's magical underwater world is even more overwhelming around Ibiza's shores, where mysterious caves and wrecks are waiting to be explored, just as the Canaries' extraordinarily beautiful volcanic ocean floor. It is full of cracks and crevices, where the most amazing sea creatures hide. On dry land, the Spanish mountain ranges provide optimal conditions for unique and eventful activity holidays in Spain. The picturesque Picos de Europa in northern Spain is certainly one of the wildest corners of the Iberian Peninsula and a true adventure playground. 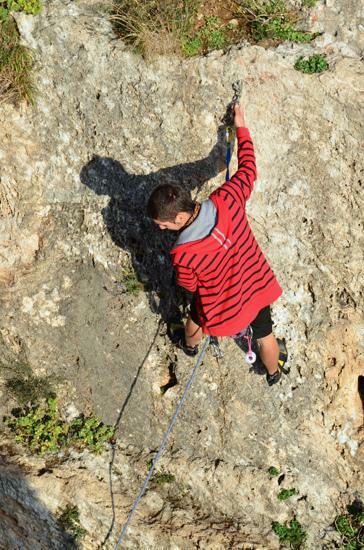 Hiking, mountain biking rafting and horseback riding are just a few of the manifold ways of enjoying this lush nature paradise, which also offers superb rock climbing challenges such as the Naranjo de Bulnes, a more than 2,500 metre high limestone peak. Similar limestone formations that are very popular with rock climbers can be found in the hinterland of the Costa Blanca and just outside Madrid. Another land-based sport enjoying great popularity in Spain is golf. With more than 300 golf courses distributed across the mainland and the Spanish islands, you will be spoilt for choice, no matter your level. The Costa del Sol, for instance, offers the highest density of top golf courses in Europe, many of which are located around Marbella. Whether you decide to swing your golf club right next to the sea, in valleys between mountains, in the desert or in woodlands – playing golf in Spain is always a unique experience as this country's golf courses feature among the best in Europe and many of them have been designed by famous international golf course architects. Spain might be associated with summer sports but it is nonetheless a great place for skiing and snowboarding! With altitudes of more than 3,000 metres, the Sierra Nevada in the hinterland of Granada is Spain's highest mountain range and offers a great variety of different pistes that you can race down from December until April. Should you, however, find that hiking, biking, climbing, golfing and skiing are all too ordinary and you are seeking a real thrill, then get your feet off the ground and discover Spain from the air! Again, the "snow-capped mountains" – the Sierra Nevada - is the ideal place to take off with a paraglider or a hang glider. Best flying season is from spring until autumn when strong thermals provide long flying hours and carry you as far as the coast and you will get to see beautiful Andalusia from a totally new perspective!